While the financial year 2017 may not have been overly pleasing when one looks at the performance of the ASX emerging companies index which returned a dismal -2.3% for the year. A different picture emerges when looking at the performance of active managers in the space. The majority of microcap managers outperformed the index. Thus, displaying yet again this is an attractive hunting ground for alpha for both fund managers and investors. A table illustrating the returns of both managed funds, which actively focus on microcaps or the bottom end of the small cap space. Together with the performance of their listed microcap LIC counterparts. 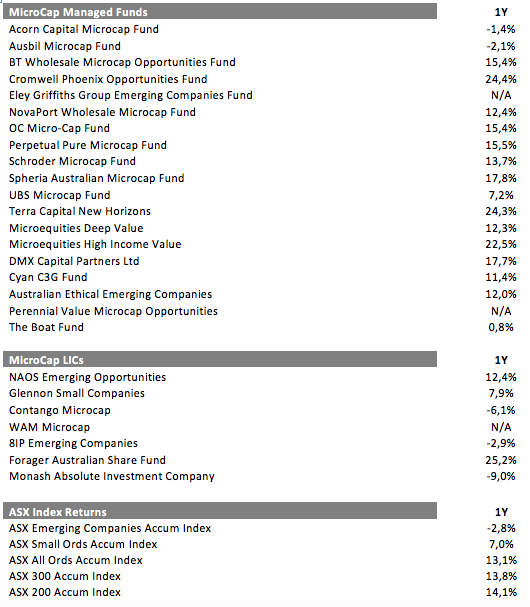 While some managed funds had negative returns for the year (Acorn, & Ausbil) the vast majority of fund managers had a positive performance for the year and not a single one of the 19 fund managers in the aforementioned table underperformed the ASX microcap index? Despite the “great rotation” or the “silent crash” in small caps/microcaps during the year we did see 2 new microcap funds launch (Perennial & Eley Griffiths) and also a new LIC from Wilson Asset Management. The more players the better in this space I say as it improves overall liquidity in the market. It also broadens the spectrum of managers available to both advisors and self-directed investors looking to allocate a capital to the space as part of their overall asset allocation. Yet again the majority of active managers easily outperformed the index. Demonstrating that this part of the market can be a great alpha generator for managers who put the work in. Aside from that their investors would have also been handsomely rewarded in terms of performance. Based on information published by Perennial earlier in the year the median microcap manager had delivered 18.8% annualised over 5 years versus the -4.8% for the microcap index over the same period. While the SPIVA reports complied to track how active managers perform versus the index notes that Australian small cap managers have outperformed the index 52% of the time over 5 years and 67% of the time over 10 years. My suspicion if SPIVA looked at microcap managers in AUS the results would be equal if not higher than the small cap performance. Of course, academics will tell us active managers can’t add alpha and index funds promotors will tell us active management is dead. Oh and just as an FYI for large cap managers it's 30% and 25% respectively. The performance of most microcap managers also handily outperformed the ASX Small Ords index and generate returns in line with the ASX All Ords index and the ASX 300/200 index which is a fine effort. Top of the pops in FY 2017 was the Forager Australian Share Fund, Followed by Cromwell Phoenix Opportunities Fund and the Terra Capital New Horizons. All delivering portfolio returns in excess of 20%. A corollary to good performance by one market participant means poor performance for some market participants. Here the Monash Absolute Investment Company Contango Microcap and Ausbil Microcap all had an “annus horribilis” as her majesty would say. However, judging any manager on a single year performance either positive or negative is short sighted. All managers need to be judged over a reasonable timeframe and taking into account a more holistic view of their investment philosophy and process. This year's under performers could be next year’s star performers. Looking at the group overall we can see that the average performance achieved by all the managers was +10.8% which represented a 13.6% outperformance versus the microcap index and 3.8% outperformance versus the small cap index.